ABC7 crews prepare to do live shows remotely following today's bomb threat. 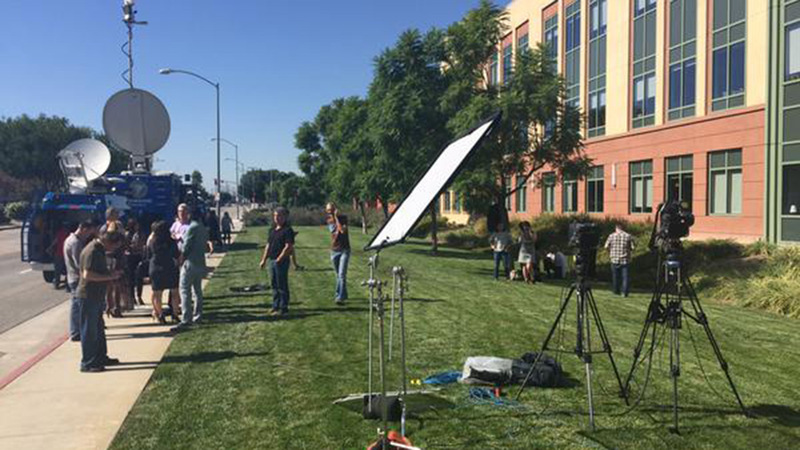 GLENDALE, CA -- Police have given the all-clear after several buildings in Glendale, including ABC7 Chicago's sister station KABC, were evacuated because of a bomb threat Wednesday afternoon. A man called police at 1:52 p.m. to say that there were several bombs in the KABC building at 500 Circle Seven Drive. Shortly after, the evacuations began. KABC broadcasted Eyewitness News at 4 p.m. from a lawn a few blocks away while officers swept the building with bomb-sniffing dogs. The all-clear was given around 4:30 p.m., and employees were allowed back in.